The portable Bluetooth speaker is fast becoming a standard accessory in our increasingly tablet and smartphone-centric world. But with so many options out there, how do you know which one is actually the good buy? 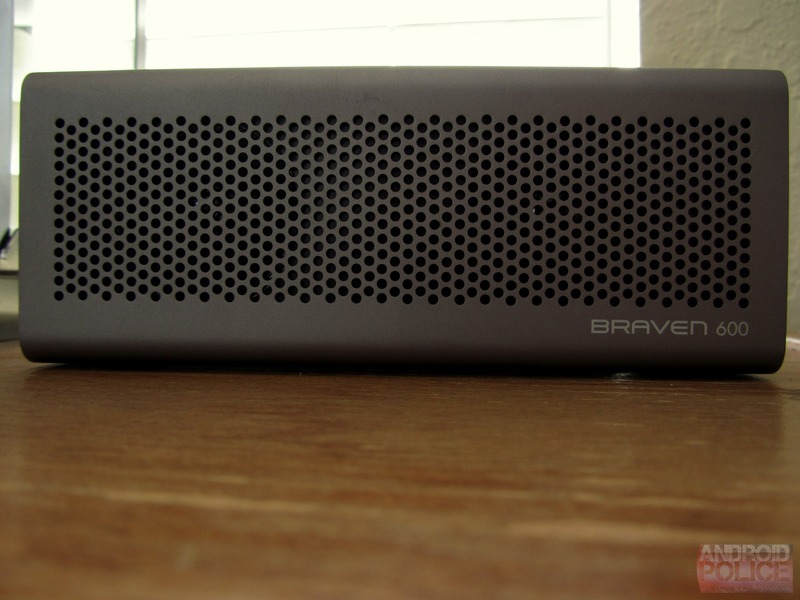 Having used several, when I saw Braven's line unveiled earlier this year, I was intrigued. 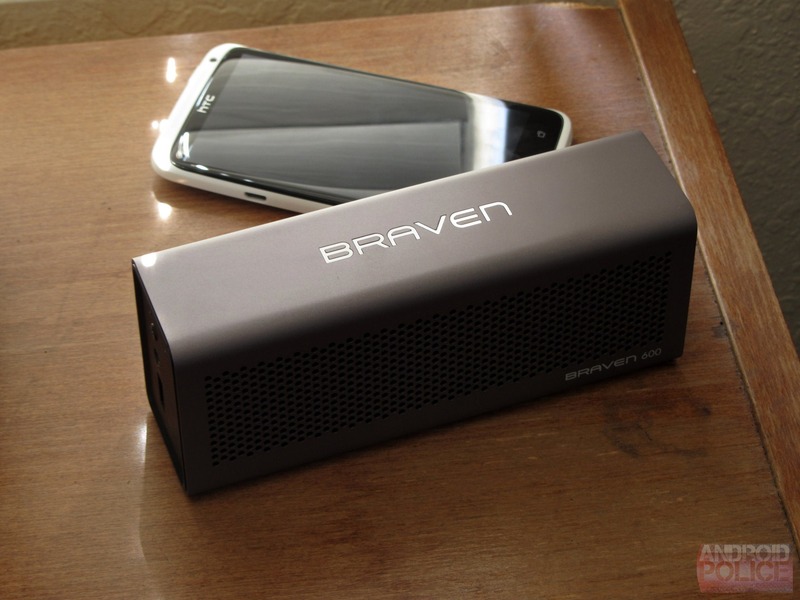 Not only did they look good, Braven promised high functionality to go with that sleek form factor. 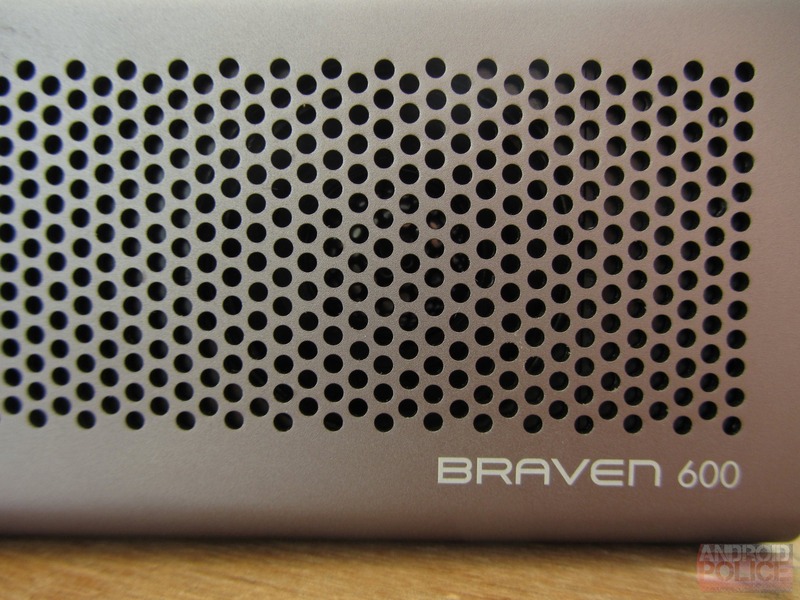 What did make me a little suspicious is the fact that Braven isn't actually a new name in the business - they previously marketed their speakers as the Spar Zephyr line, and have undergone a makeover for their next generation of hardware (which looks exactly like the previous generation). The Braven 600 is the company's "entry-level" model, though that's more in the BMW 3-series rather than Ford Focus sense of the word, as it comes with a $150 price tag. Braven offers only three products at present, the 600, the 625S (a ruggedized take on the 600), and the 650. While I really wanted to get my hands on the range-topping 650, the 600 actually left such an impression that I'm now curious how much better-sounding the 650 could actually be. Two speaker drivers with matching passive subwoofers power the 600, for a total power output of 6w - 2 more than the comparable Jambox. Wattage, if you're unfamiliar with the term as used with speakers, is a measure of power output, and corresponds to a large degree with the level of loudness a speaker is capable of producing. More watts, more noise (note that it doesn't mean better noise). For such a pint-sized package (see photos), the Braven 600 produces sound of a volume significantly higher than one would expect. It's no stereo replacement, but it is not meant to be. The sound it produces is also of a fairly astonishing quality given its diminutive nature (and even its price). However, your real question is probably this (I'm guessing): how does it stack up against the current Bluetooth speaker incumbent, Jawbone's Jambox? And I will cut to the chase, for those of you wondering. It's better in the ways that actually matter - sound and functionality. 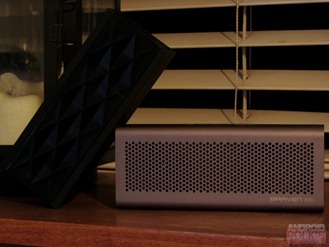 Aside from hardware controls and software, where the Jambox still reins supreme, the Braven 600 is just better. And cheaper. And good cheap things are... well, good. What is it? 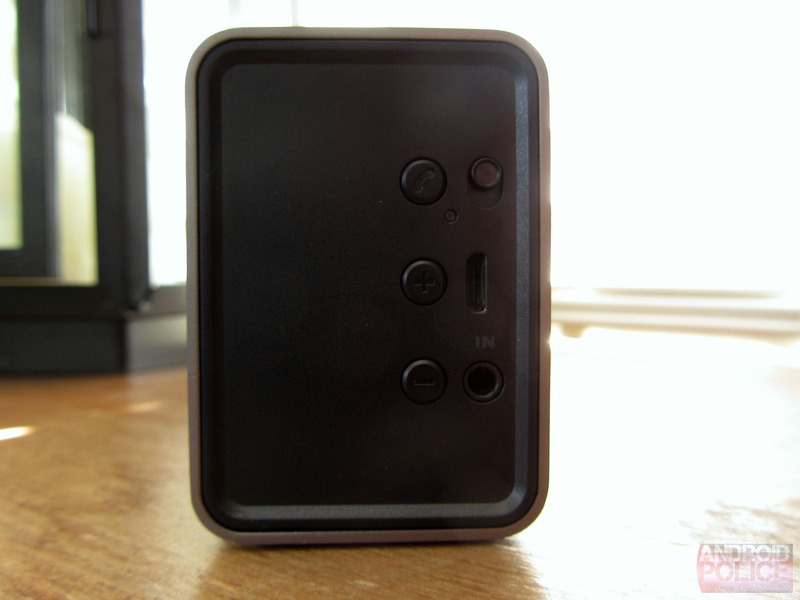 A portable Bluetooth speaker. What's in the box? Speaker, A/C adapter with microUSB charging cable, male-to-male 3.5mm stereo cable, and as a bonus, the most frustrating retail packaging in existence. What's so special about it? It can charge your phone, you can daisy-chain multiple Bravens with the included 3.5mm cable, and it's made of a big piece of aluminum. Do I want it? 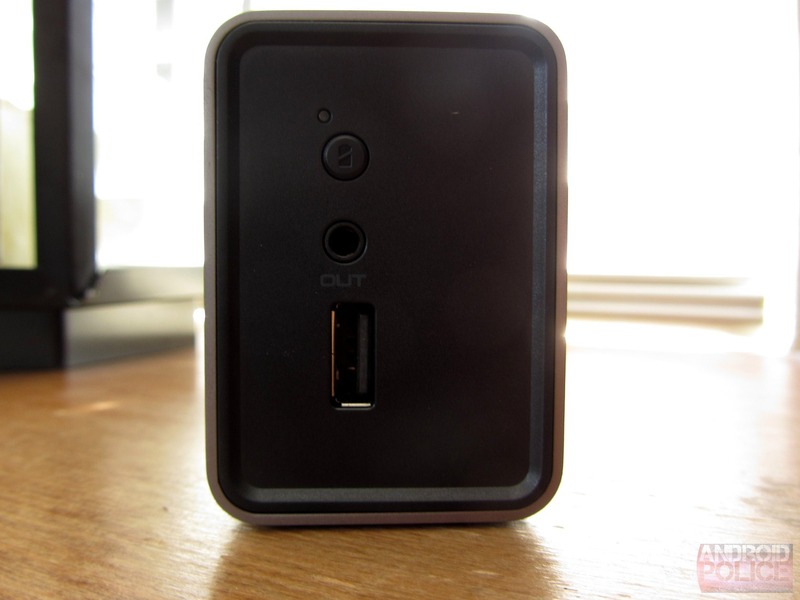 Do you want a very small and versatile portable Bluetooth speaker with great sound? Then this is probably the one to get. 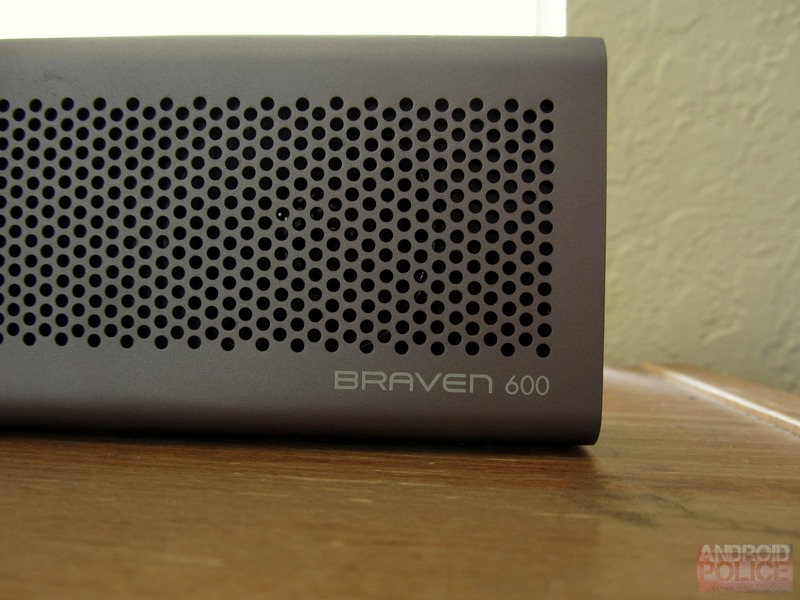 Sound: The Braven 600 puts out sound that I simply did not expect, and in the best way. 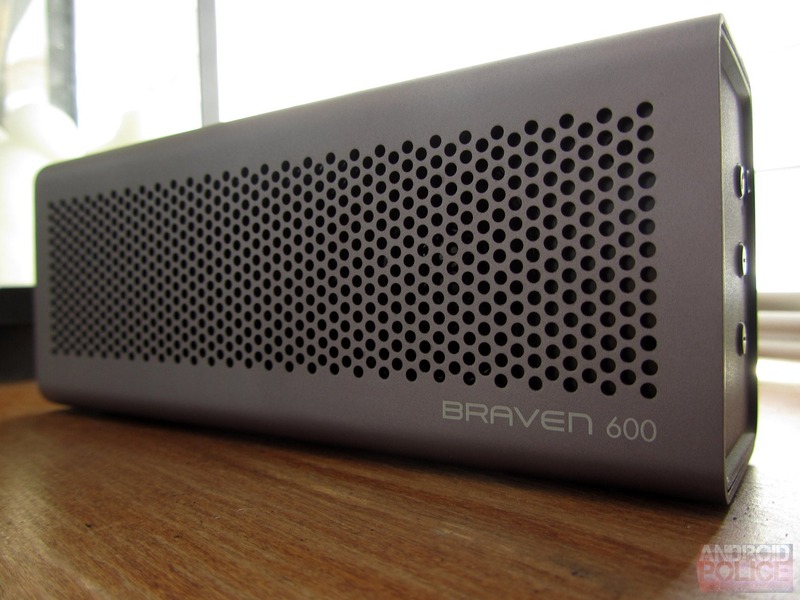 Unlike the Jambox, which is so bass-forward that sound actually becomes garbled when you crank it up, the Braven 600 provides a balanced listening experience across the range. Bass is weaker than the Jambox, but it's also not nearly as distorted at high volumes (a very bass-heavy track will still elicit the characteristic "flapping" sound of a maxed subwoofer when the volume is high). 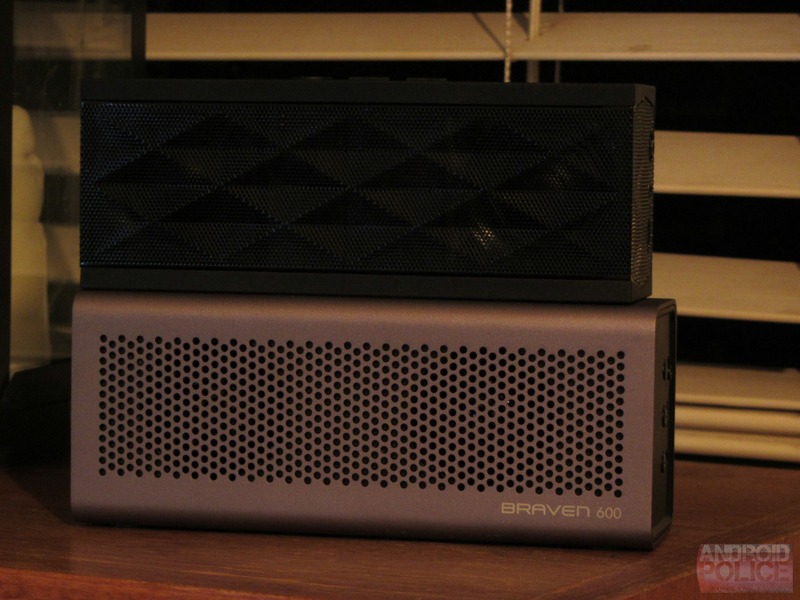 The two passive subwoofers do make sure the low frequencies aren't lost, but from over five feet away, it's pretty hard to tell the difference between the Jambox and the Braven's bass response, as it's lost so quickly at a distance. 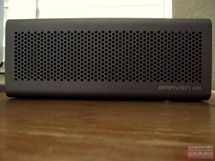 The Braven also just sounds a lot more clear and less tinny (the Jambox sounds very hollow by comparison) overall. 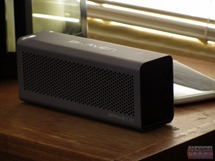 Volume on the Braven is better than the Jambox as well, you can definitely push it noticeably further. 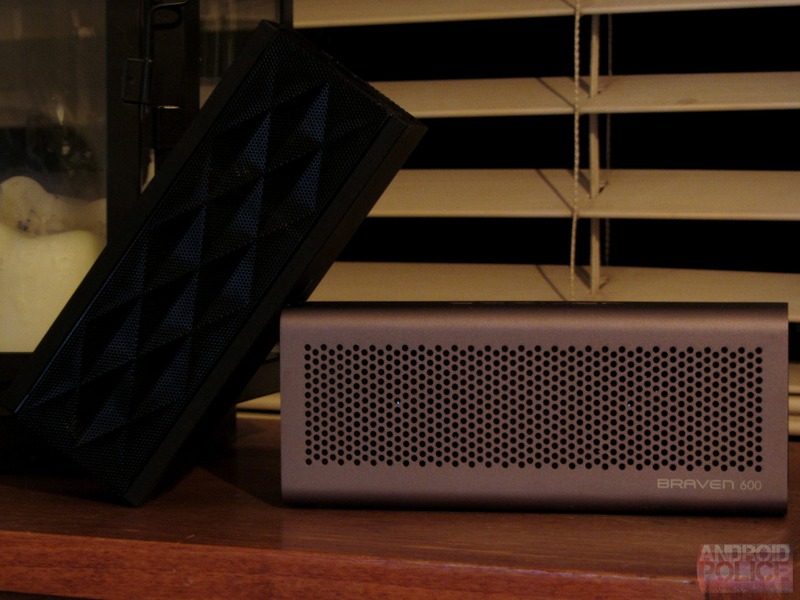 In terms of raw sonic quality, the Braven 600 is miles ahead of the Jambox, and I doubt anything else at this price point could really provide it a serious challenge. Battery Life: Braven promises 12 hours of battery life, but let's be real about this. It's a portable speaker, and battery life is going to be even more ridiculously subjective than something like a smartphone or tablet. There's a 1400mAh cell in the 600, and I haven't had to charge it since receiving it. It's at the very least comparable to the Jambox in this regard, so it gets a pass in my book. 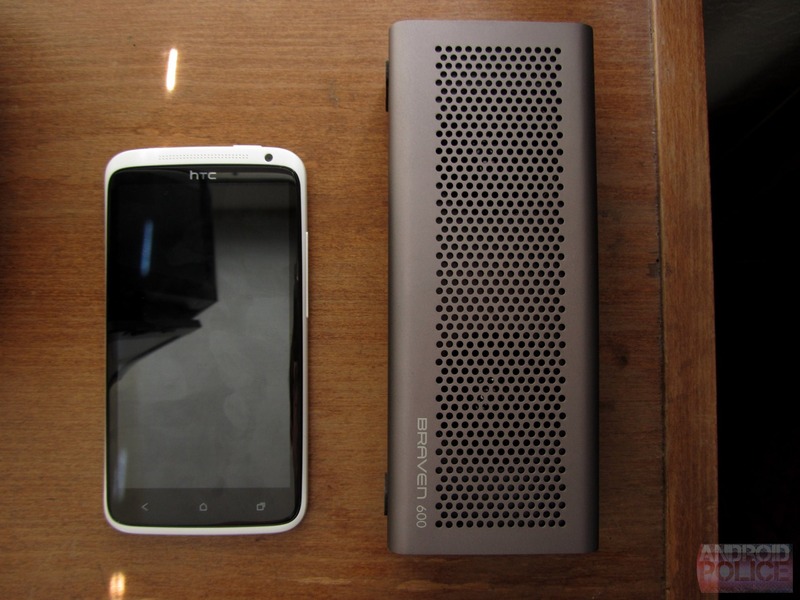 Added Functionality: You can use the Braven 600 as your own personal power bank to charge up your phone. While the 1400mAh cell will probably drain fairly quickly even over USB trickle charging, it's a great added feature that just makes sense. Most people won't be using this device in a capacity where it'll run out of juice before returning to its charger, but if you're pumping tunes from your smartphone, it's a convenient little feature to have on the go. Additionally, the ability to daisy-chain (output the same sound to multiple speakers) Bravens using the included 3.5mm stereo cable is really cool. This also means it can pump sound into any speaker with a 3.5mm audio-in jack, so you could even hook it in to a Jambox. And it also works as a speakerphone, hooray! 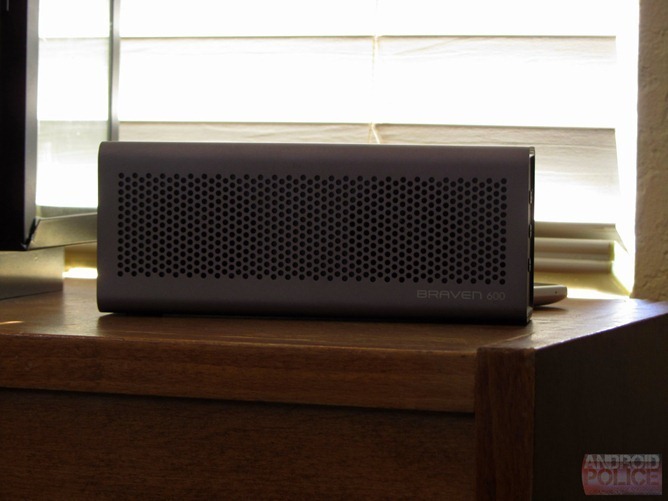 Build Quality / Design: There's no denying that the Braven is a striking piece of hardware. It also feels ridiculously solid - the aluminum covers everything but the end-caps, and has absolutely no give or tendency to bend whatsoever. As for the design, I guess that's a matter of taste. 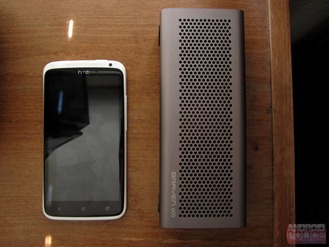 I like the look of the Braven, but I don't love it. Personally, I think the Jambox's minimalistic all-black look is a little more modern, but hey, it's a portable speaker, do you really care? Connectivity: Bluetooth connectivity was quick and painless, as it should be. The 3.5mm audio-in jack works, but its impedance is just too high for a smartphone headphone amp, audio comes through noticeably quieter when you're using the cable. Controls: The tiny little effing buttons on this thing are stupidly hard to use. Seriously, why can't we just use a dial knob or a wheel or something for the volume? Using buttons, unless they're ridiculously large and easily found (as on the Jambox), is dumb dumb dumb. Rubber Feet: There are two little rubber "feet" on the bottom of the Braven that are glued onto the aluminum chassis to stabilize it. I can't help but feel that, one day, they will start to peel off. This fear may be totally irrational, but it's the one piece of the whole thing that I don't have confidence in the quality of. Bluetooth Audio: Bluetooth audio still isn't perfected. Cutouts occasionally (rarely) happen, and the quality is good, not great. Let me put it this way: you know you're losing something. But if you're using it for movies, TV, and games, that's less of a concern. As a wannabe-audiophile, I can say this isn't how I want to listen to my music, but it's much more bearable than the similar alternatives. Software: There isn't any. No companion app, no firmware update system, nada. This is where the Jambox gains a lot of points back, in my mind. I want to know how much battery my speaker has remaining. I want to adjust the device volume from 5 feet away instead of using those infuriatingly small buttons. Is this stuff necessary? No. Is it a nice touch? Without a doubt. Smudging: Dark gray anodized aluminum aluminum shows fingerprints and smudges. It's not a big deal, but hey, I noticed it, and figured it was worth a mention. Packaging: The most frustrating packaging ever. Yes, worse than the Jambox. Why do these sorts of things need to be encased in a clear, hard plastic shell held together by copious amounts of tape and pure evil? Put it in a box, and put a picture of the damn thing on the front. It seems very, very unwise to make your customer begin their experience with your product with agonizing frustration and anger. To wrap things up, if you're looking for a very portable Bluetooth speaker at a reasonable price (eg, cheaper than a Jambox), I'd say this is the one you'd want to go with. 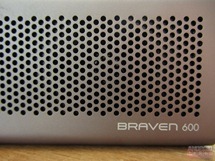 That, or its big brother, the Braven 650 (the 650 has a larger battery and upgraded speaker drivers). Braven has put out a high-quality piece of hardware at a price that I think is very competitive given its performance, and I don't think you can ask for much more than that.